People are always reinventing everyday item in a special way that makes us go: Why didn’t we think of that? Such was the case with the redesigned Pringles packaging we saw this week. 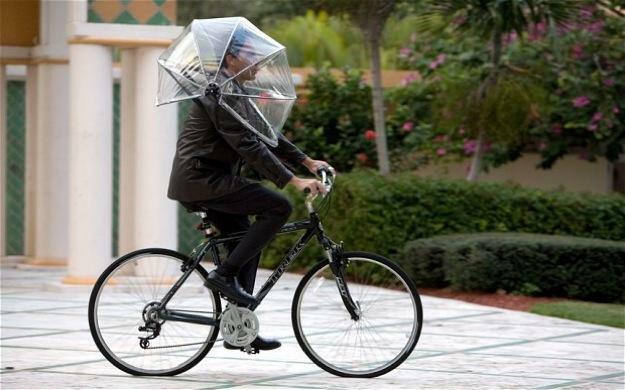 But this handsfree umbrella? We’re not sure what to make of it. Named the Nubrella (not to be confused with Nutella), this umbrella design straps onto the wearer’s shoulders for support while a plastic canopy covers your head to shield from rain. The Nubrella weighs approximately 2.6 pounds, and allows the user to continue performing two-handed tasks like riding a bicycle or carrying multiple grocery bags. Too tired to hold an umbrella? They must also want to also look cool enough to rock the spaceman bubble look. With spring finally bringing some showers to the states, perhaps you’ll be interested in getting your own Nubrella for the season. Dubbed the “Ultimate Weather Protector,” you can also look like an evil overlord should you choose to purchase the black color version. Your only other option is see-through. When you’re done using it, Nubrella also folds closed into a thin curve with a handle for carrying. “I never planned on inventing a product, I just noticed a problem and came up with a solution,” Kaufman affirms on the official site. Nubrella can be yours for $50. Bike riders, beware. This isn’t a replacement for a helmet despite the shape!